Learn To Use Melodyne Like a Pro! Vocals are the heart & soul of a song. Because if this, it is essential that you learn to treat them with the detailed attention they deserve. Melodyne is a powerful tool that allows you to tweak a singer's (or instrument) performance to a tasteful amount of perfection. But like any powerful tool, it can be confusing and overwhelming. No need to worry, Fab’s got your back. Follow along as he shares his refined approach to using Melodyne in the most musical way possible. How to effectively use things like note separation, amplitude tool, pitch modulation, pitch drift, and more! Addendum: as of Melodyne 2.X+, files are now stored in the session folder. Good morning children! Today, we're going to turn water into wine. using Melodyne, taste, and discernment. being slightly off, because she was busy setting up her monitoring system. Here it goes! Let's add Melodyne to the vocal track. you must make absolutely sure as to where Melodyne is gonna put the files it creates. Melodyne has a tendency to do whatever it likes. And that's fine enough, we're in democracy. But it doesn't work for us. that's not the same drive as your current session. In 6 months from now, when the singer calls and wants to recall the session for just one note, you will hate yourself. I make sure that the files are parked in the same folder as my session. To do so, you have to do... this! You go into Settings. And then you have to navigate your drive to where your session's gonna be. In this case, it's Internal Audio / Puremix / Puremix Sources / Might as well be Spring tuning. every single file that Melodyne creates will be in that folder. you must make sure that it goes into the same folder as the song. Every single time. I promise it's worth the grief. Second. Set yourself up for success. Here's the workflow that I think works best. You can tweak it for yourself, but this is a good basis. If you see the window the way it is right now, it's enormous. and a reference track, and Melodyne, all in the screen. To do so, you go to Preferences and you enter a User size. In this case, I like the Width, but I don't like the Height because I wanna be able to see the whole height. So I'm gonna set up 600, for example. Press Enter. For you to see the FX, you have to close the plug-in and reopen it. Boom! There you have it. your tuned track... and Melodyne. You cannot locate in Melodyne. You can click here in Melodyne, and Pro Tools won't go there. You can only click in Pro Tools. So now, you can have your location area here and then you'll always know where you are. Then, you have your tuning area here. It works best this way, as far as I'm concerned. even if you only plan to tune one or two notes, for several reasons. and what's coming from the Melodyne memory. and wondering why Pro Tools is not playing back what you're doing. Most of the time, the reason why that happens is you tuned that one word in Melodyne last week, and forgot. Transfer everything into Melodyne, so you won't be able to do that anymore. Second. Your singer will ask you to recall this and tune another note next week it's a guarantee. you may erase what you just did. Might as well just take everything through and not have that problem. after he asked you to tune another note. It's a guarantee. and make sure that the sound is consistent throughout. At this time, you press Play and transfer. Don't just press Play, press Play and listen. This is your chance to get a bird's-eye view of what needs to be done. Looking at the tuning job note by note is guaranteed doom. what's gonna happen is you're gonna try and make everything perfect and take all the life out of the music turning your singer, no matter who your singer is, into Britney Spears which is a bad thing to do. The idea here is to listen to it on the emotional level and try and figure out what's in the way. If there's nothing in the way of you enjoying the music, don't tune anything. If something is in the way, and kind of yanks you out of the emotion then that you're gonna tune, and only that. So let's listen to Sara. Number 1: dont't look, listen. The little cases, boxes, that Melodyne lets you put the pitch in is evil. Number 2: don't use pitch or note snap, and don't use the automatic mode it will fail you miserably and repeatedly every time. Number 3: don't tune in solo. Use a pitch reference, like the bass or the piano of the song. Why? Because you're not trying to make the vocal perfect you're trying to make the relationship between the vocal and the band perfect. And that's a much different thing. So the first thing I'm doing, always, is remove Pitch Snap. So now, I'm on my own, like a grown man. I zoom a little bit, so I know what I'm doing and I zoom a little bit this way, so I know what I'm doing. Let's listen to the top of the song again. See, I'm able to locate here, without having to close the plug-in. Here you go. Listen to this. I'm gonna play that phrase again. Try and figure out what bothers you there. As far as I'm concerned, the "Willow" is a little approximative and the "Wind" is a little sharp. So the easy one to do is the "Wind". is just grab the word, and move it to where you want it to be. That's better. As a reminder, this is the way it was. Where am I gonna put this pitch? I don't know. I'm gonna move it a little bit in the direction that I feel it should go and listen to it. If I like it, leave it there, if I don't, try something else. What I know is this: most singers undershoot even the best singers in the world. Why is that is a different discussion, but that's the way it is. I'm gonna put that singer where that singer would have put it if he had nailed it. And that's not usually exactly on. It's a little under, or a little over. Let's pick one position for the word "Wind", and listen to it. Now, I kinda like that! Let's listen again. It's a little sharp-ish still, but here's the problem. It's all about the relationships between the notes. this will never feel good. You're gonna want to tune this. And that's the whole problem: where do you stop? If you start tuning this, then this is gonna want to get tuned and this one's gonna want to get tuned, and this one too, and Pouf! You're Britney Spears. So you have to use lots of restraint. In this particular case, I think the big problem is "Willow". The "Willow" is not quite precise enough and is the articulation of the phrase. So I'm gonna fix "Willow" and see how the rest feels after that. She's not quite nailing both notes. And Melodyne thinks it's just one note. This is how you deal with it. you can go right under the waveform here and double-click. If you don't have those skills, you can use the Separation tool right here and double-click on the note. It's now two separate notes. Switch back to your Select tool. You can now move this independently from this. And it's gonna sound this way. Ha ha! This brings a new perspective on life. I like to listen to the whole phrase to get the arch of it and note just focus on one note. All of a sudden, "Wind" sounds wrong, so I'm gonna move it back up here. That's good enough for me. I'll play it again. Could we massage this more? Yeah! Shall we try "Will" a little higher? Mmm! Sounds nice! So that's the process. Look at it as a phrase, not as a bunch of notes. If you look at it as a bunch of notes, every note is wrong. And you're gonna spend 12 hours doing this, and end up with Britney. If you look at it as a phrase, she sounds like a lovely singer to me. Hear the word "Have"? I'll play that again. "I'd say I have, have, have"! That's a little flat. That definitely needs love. That's too much love. A little less love. Listen to the word "Have", compared to the other words, now that we've tuned it. See how it feels in the field. Does it feel louder? A little bit, weirdly? She probably leaned towards the mike. 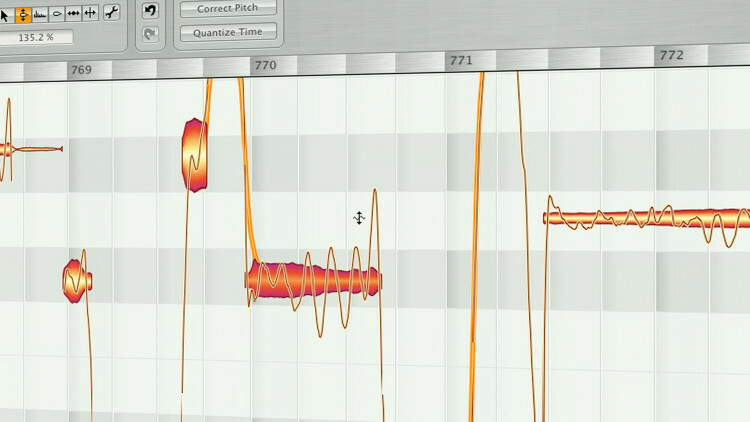 Here's something else we can do in Melodyne, that's kinda cool. Melodyne is usually the first plug-in in your stack. Of course, dynamic things like this can be done with a compressor. But what if you could do it pre-compression and basically do some quick manual compression that's non-destructive, and sounds good. Check this out. I can use the Amplitude tool and just lower the waveform a little bit here. Much more natural, and I don't need to compress. Now, you don't wanna do the whole track like this. But those words that really stick out, they're gonna force you to compress a lot you can take care of in here in a very transparent manner and not have to compress so much. That's a good trick. Melodyne is fantastic, because it gives you subtle tools that let you salvage performances that otherwise would have to be thrown out. Two of those tools seem to confuse people a lot. They're the Pitch Modulation tool, and the Pitch Drift tool. and there's too much of that vibrato, that's the Pitch Modulation tool. It's also good for doing "Baaaah", and fixing too much of a sway there. If your singer hits the pitch, but then kind of drifts and hovers like this, "Baaah" there's no vibrato involved, that's the Pitch Drift tool. The combination of the two lets you fix just about anything. "My Daaays...", I think "Daaays" a little hover. It's good, but, she wouldn't do that. She would do a little less. So you can right click, and hit Pitch Modulation. And make it less! Like this. Of course, you can add it back, and it'll put more in. Which is in tremendously bad taste. So I'm gonna go back where I was before. reset everything to 0, so you don't have to freak out that you're screwing up the performance. You do that in Edit / Edit Pitch / Reset Pitch Center to Original Reset Pitch Modulation to Original, and Reset Pitch Drift to Original. So you can always go back to your source material. I like this probably a little less. Pitch Modulation, less of it, like this. Ok! Now, listen to the last word... "Be". It's going up, it's going down, it's a little in and out. So I'm gonna switch to the Drift tool. And tell it not to drift so much. Lovely! Again, with less piano, so you can really focus on the pitch of the singer. This is the original pitch. And this is the pitch with a little bit of the Pitch Drift action. So, the combination of Pitch Modulation for this part and Pitch Drift for this part lets you really get every note where you want it to be like painting the pitch on. You must, absolutely must, no matter what, print your Melodyne work to a track. Don't expect the plug-in to recall, a year from now. This stuff doesn't travel well, just make it in stone. in this case I need a Mono track / Audio Track / Samples. which, in my case, is the SUM output. Put it in Input, and make sure it's getting sound. Alright, so "Willow" is sharp. You have to do in passes. Any tuning, with any plug-in, you have to do in passes if you're gonna do it with your brain, not with the automatic system. After listening to the same phrase for 5 minutes you will no longer have any reference. you'll have a fresh view on it, and you can adjust it. I think "Willow" is too sharp, I'm gonna bring it down. That's it! Now, go Melodyne something! Et voilà! Since Antares AutoTune is known for its smooth transitions in tuning vocals would it be wise or logical to send a Melodyne tuned vocal into Antares AutoTune to get a final polish? In other words does combing the best assets of multiple vocal tuning software offer any advantages from your experience? @punsapops, it's the old fashioned way to commit tracks pre-PT12. I use commit to print Melodyne these days. Great video. Question. Is printing to a new track better than committing the tuned track? Or just different? This is the best Melodyne tutorial I've seen from anyone yet. Thanks for actually applying the techniques while explaining them. That's what makes your tutorials so awesome and most others just animated product manuals. @shzlgsngar: Technology can only do so much. It;s a miracle it does what it does frankly. It your vocal is so out/weird/special that Melodyne can't fix it/make it good without artifacts then you may need to re-track. The formant tool is sometimes helpful in compensating for weirdness but it;s more a special effect thing. I would love to see a video on coping with other melodyne-typical problems. What especially comes to mind, is formant problems. Sometimes, even pitching not too much, will result in a note that doesn't seem to fit into the context. I have yet to come to a good solution for that problem. The formant tool seems to be quite fragile. I usually stick to not touch that tool at all for those reasons, except fancy effects. Fab, do you use this tool at all when it comes to achieve a clean, not too fancy sounding vocal? I H A T E Melodyne!!! Okay, not really, I love it actually. I just hate falling into Melodyne's evil trap!! Okay, ultimately I just hate myself because I wield the power of Melodyne without restraint, or consideration. There, I said it. Seriously Fab, you have helped to save me from myself. Your tips on initial set up and looking at the phrases instead of the individual notes have made a big impact. This lesson was supremely helpful. Thank you! I've had so many problems with Melodyne! An you give me the answers in two minutes!!!! thank you!! Although I'm working with autotune 7 I find this tutorial very helpful. Printing the autotunetrack to a new track is something I will certainly do next time! Thx! You've saved me countless hours of agony and headaches. FABulous!!! Fab! Awesome video!... I have a question, I can't seem to be able to get past the first part. It seems like my Protools 10 takes control of where Melodyne saves. Could you direct me as to how you made yours flexible. Maybe we are running different versions of Melodyne?... Please help, Thanks! Fab is not only a good audio engineer and producer but the funniest one around on the net. I enjoyed this video very much! Looking forward for the harmony video. I use revoice pro for ADT, melodyne and revoice pro make a nice combo! Just love it ! Great video. You have demystified the Melodyne plug-in for me in a 17 minute video, and now it doesn't seem as intimidating. I am going to check it out. Thank you. Melodyne are you watching this? @BobRogers: The Studio One/ Melodyne workflow is awesome. Coming soon to other daws near you too. This workflow is useful still we feel and also great to develop coping mechanism with DAW limitations. @juancopro-flow: Melodyne is great for harmonies. We'll do a video on that too. A good combo of pitch, formant and modulation gives great results. Great tutorial Fab! Wish I had this two years ago. Would have saved a lot of trouble scaling the learning curve. I've been using Studio One rather than PT lately, so a lot of those workflow lessons aren't necessary anymore. I love the integration of both the workflow and the interface. Thanks FAb, you make everything look so simple.